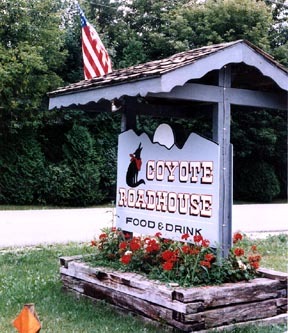 Coyote Roadhouse is on County E at Kangaroo Lake. The menu offers steaks, ribs, fish, burgers, homemade soups, quesadillas, sandwiches and more. Our Friday fish fry features excellent fried Grouper. Enjoy your favorite cocktail or dine on the deck overlooking the lake. Were located on the snowmobile trail. Bring the family to Baileys Harbor. Open year round for lunch and dinner. Nov-Apr dining Su-Th 11-8, F & Sa 11-9, bar 11 until close.